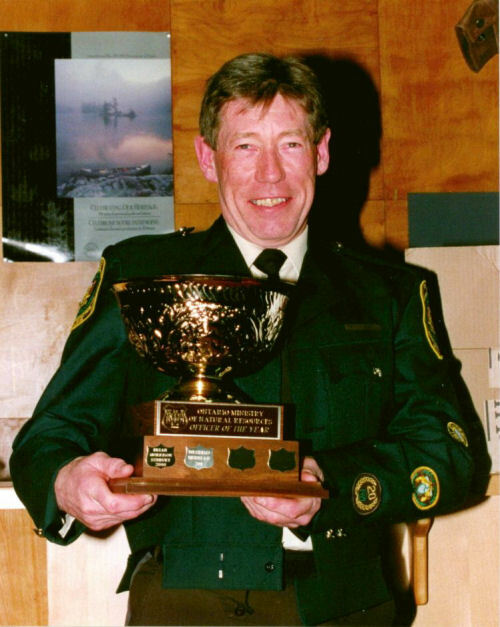 Bob Stewart, Thunder Bay District Conservation Officer received the year 2000 MNR Conservation Officer of the Year Award at the Frost Centre on February 26, 2001. Mike Morencie, Supervisor of Evaluation and Special Services Unit, presented Bob with a two-foot high cup, a number of plaques and a leather jacket. In addition to the awards, Bob is entitled to a 10-day stint as a Conservation Officer anywhere in North America. He would like to go to Alberta or Wyoming so that he could work on horseback. Bob loves his job. Recently, he could have opted for early retirement. But as his fellow Thunder Bay District Conservation Officer and nominator Ted Chisholm testifies, he is as enthusiastic now as he was when he started 30 years ago. “During a time in their careers when many employees of any agency tent to draft into pre-retirement mode, Bob has maintained a drive and enthusiasm for his work that I wished could be instilled in officers throughout their careers. He employs a level of dedication and professionalism into his work that separates him from an “average” officer and he has done so throughout his career,” said Al Farrer, Kenora District Enforcement Supervisor. Throughout his career Bob has been a role model for many young Conservation Officers. Rick LeBlanc, now a Conservation Officer in the Kenora District and one of the two officers who nominated him for the award was once a Deputy CO under Bob’s wing. “When I worked with Bob I took notice of the contacts that Bob had established in his patrol and community. Small courtesies that he showed people paid back big dividends over his career and earned him respect. When I deal with people on the job, socially or in a confrontational manner, I almost always think of how Bob would handle it. He always gave you credit for your impressions and thoughts, even from a green rookie”. And what comes through over and over again is Bob’s intelligence, his quiet strength, his thoughtfulness, his modesty, his generosity, his sense of humour, his understanding of human nature and his great enthusiasm for his job.